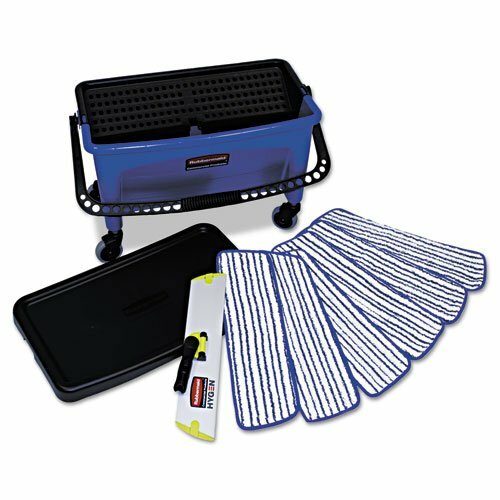 Minimize the potential for contamination by dedicating a color-coded system for floor finishing tasks. Kit includes almost everything you need to get started: finish pads, mop head frame and a lid-equipped bucket that doubles as a protective kit container. (Lid sold separately) When used in combination with Quick-Connect handles (sold separately), each piece works together to ensure smooth and even finish application. Foam-lined microfiber pads soak up more finish than standard mop heads while providing better liquid-release control. Angled, washboard-surfaced bucket wall simplifies excess finish removal. Bucket's lip-mounted handle-sized notches keep mops upright and ready for use. Capacity Range (Volume) [Max]: 27 gal; Material(s): Plastic/Microfiber; Color(s): Blue/Black/White; Suggested Use: Floor Finishing.